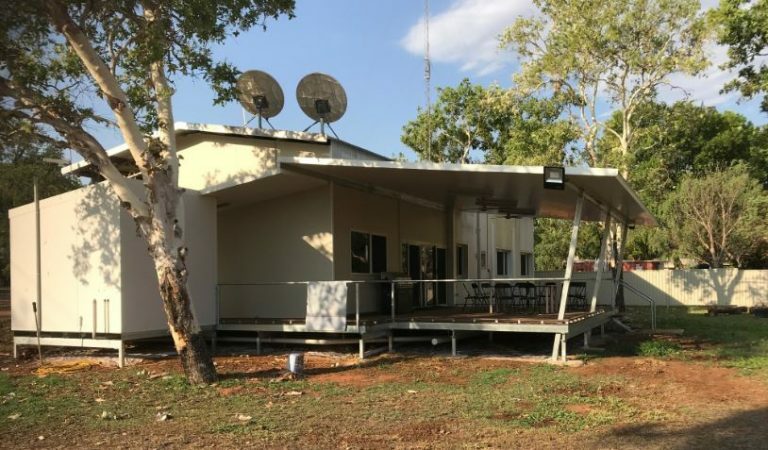 Since 2003, Reach Beyond (formerly HCJB) has been transmitting from our Broadcast Facility in the Kimberley, in far north Western Australia, to the Asia Pacific region through shortwave radio and today broadcasts programs in 30 languages. Reach Beyond is part of a global community committed to seeing Jesus known and loved among all people. We are a partner-driven organisation that aims to reach every unreached people group of more than 100,000 individuals giving them ready access to a relevant and life-changing gospel message. Founded in 1931 as radio station HCJB in Quito, Ecuador, Reach Beyond is now a global, partnership-driven ministry. Many people know us as the shortwave ministry that originated in Ecuador which went on to establish hospitals and medical clinics in Quito and Shell. Today the visionary “madness” of our founder Clarence Jones and his band of missionary pioneers lives on around the world. His relentless faith serves as the foundation that drives us to the darkest corners of the earth to reach those who haven’t yet heard of the Saviour who changes lives forever. Here in Australia, Reach Beyond carries on that vision through its radio broadcast ministry. Our shortwave facility is uniquely placed in Australia to deliver powerful messages of hope to remote and isolated communities throughout the Asia Pacific region. To see Jesus known and loved among all people. To facilitate a partner-driven organisation that aims to reach every unreached people group of more than 100,000 individuals giving them access to a relevant and life-changing gospel message. Using our specialised skills in the areas of media, health and community development, and our commitment to partnership, our strategy is to be the voice and hands of Jesus – together. The task is enormous, reaching the unreached as the voice and hands of Jesus. We can’t do it alone but we can do it together. We believe that everyone deserves the chance to hear about Jesus. We leverage radio and digital media resources to reach beyond borders. We are uniquely placed to deliver a message of hope to unreached people groups around the globe. We believe the gospel needs to not only be proclaimed, but also demonstrated by serving the needs of unreached people groups beyond just words. We do this through community development and medical outreach projects. We believe that the best way to fulfil the Great Commission is through empowered partnerships. In conjunction with organisations around the world and partnering with local churches and individuals, we can make an impact beyond ourselves. From the early 1950’s, people in Australia caught the vision of sharing the gospel around the world and for the next three decades, under various leaders, HCJB in Australia (now Reach Beyond) went about the business of promoting the worldwide ministry, raising support for the work and sending a number of missionaries to serve in Quito, Ecuador in radio, healthcare and other areas. The name HCJB Global incorporated the call letters of our original station in Quito, Ecuador. 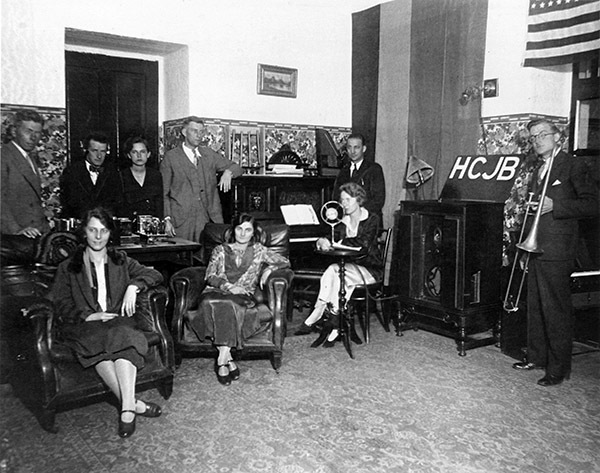 What started in 1931 as a local AM station grew into an international shortwave ministry that operated under the same call sign HCJB – the Voice of the Andes. After returning from service in Ecuador, Charles and Val Gray actively promoted the ministry and also had a small studio built on their property where programming for HCJB was produced. In November, 1986 HCJB in Australia was incorporated and became The World Radio Missionary Fellowship of Australia Inc.
That same year the ‘World by 2000’ Partnership of HCJB with FEBC, TWR and SIM (ELWA) began and the worldwide search for speakers of needed WB2000 languages began. In 1988, during Dr Ron Cline’s deputation visit to New Zealand, God spoke to David and Glenis Maindonald and within months they arrived in Australia for David to become the ministry’s first full-time director of the Australian office. By 1991 our studio was no longer able to meet the expanding programming opportunities, not only for HCJB but also for local and international release. Through God’s amazing provision, an offer of land and partnership came with The Canterbury Gardens Community Church in Melbourne. “The site could not have been better situated if we had been actively looking for land ourselves. Not only is there more room than we could ever have dreamed of … it’s perfect, truly a provision of the Lord!” said David Maindonald. The New HCJB Australia Headquarters and Studios were dedicated and opened on Sunday December 5th, 1993. These studios continue to produce, duplicate and dispatch programming for Reach Beyond and others in a number of languages for local and international broadcasts. In 1997 a formal offer of a 200 acre property situated adjacent to the Ord River and Diversion Dam, 6 km from the township of Kununurra, Western Australia was made to HCJB Australia. This offer was accepted and the property transferred ownership on 25 June 1998. Through God’s action and the hard work of a few dedicated people, the laws of Australia were changed so that on 19 April 2001, HCJB Australia was granted four international broadcast licences with the opportunity to share the gospel through shortwave radio to the Asia Pacific region, containing 60% of the world’s population. 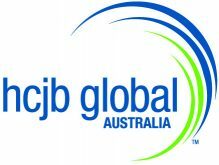 With God’s help and provision, on 5 Jan 2003, HCJB Australia became an International Broadcaster servicing the South Pacific. A month later our broadcasts to Asia began. In the years before and since those first broadcasts, while praying, working and watching, we have seen God open doors, remove obstacles and provide in so many remarkable ways. We are excited to see how God is using this international shortwave broadcasting facility for His glory throughout the Asia-Pacific region. In 2014, after more than 80 years as HCJB, the ministry changed its name from HCJB Global to Reach Beyond. Reach Beyond continues to reach into remote places around the world where the name of Jesus is unknown, resisted or marginalised. Here in Australia, God has given us the opportunity to reach beyond our borders to the people of the Asia Pacific region via shortwave radio. Today we broadcast in over 30 languages to the Asia Pacific region. 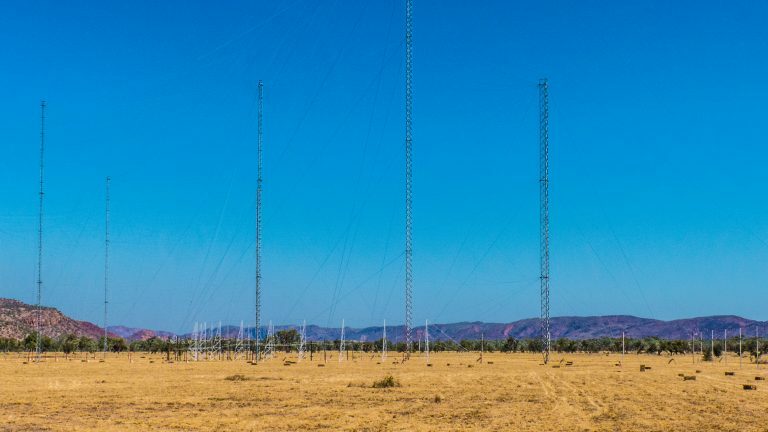 The broadcast site has moved from the 200 acre farm property to a nearby larger piece of land, that is leased from the Western Australian Government, where large antennas have been built, giving us a much stronger and clearer shortwave signal for our listeners. The original 200 acre property has been developed to include staff housing as well as an accommodation block and caravan park. The property caters for long-term and short-term staff and volunteers and ministry teams. It also continues as a working farm, growing bananas and mangoes along with sandalwood trees, creating a revenue source for the ministry. It is also the home of the newly opened Alta-1 College providing school education for local kids that have fallen through the cracks of the normal school system. We are looking for further opportunities to expand the use of this property for ministry to the people of the Kimberley. In Melbourne, the office and studios are busy with various administrative tasks as well as program production and scheduling. A number of partner ministries lease offices and use our studios to record their programs. Pray with us, as we continue to develop the ministry God has entrusted to us, that lives would be changed and transformed by the message of hope in Jesus. We are uniquely placed to deliver this message. For further reading about the history and story of Reach Beyond in Australia, you can purchase a copy of Beyond Borders. Learn more here. Clarence Jones was a man of bold faith. Six radios in the country…and he starts a radio station. That’s bold faith. So many of our pioneers were men and women of great vision who stepped out in faith and took risks for the sake of the Gospel. Today, we are still a ministry of BOLD FAITH as we proclaim and demonstrate the gospel to the least reached. We serve among some of the hardest-to-reach people groups in countries with high security risk, but we are seeing a bold work of the Holy Spirit as lives are being changed. In the beginning of the ministry, our team lived and served together in Ecuador, where there was a genuine sense of family. Although today we are spread out throughout the world, we are still committed to welcoming, valuing and caring for our Reach Beyond family. We are also committed to establishing spiritual practices that reflect the “Jesus Way” as opposed to the world’s model for living. From the very beginning, we have always been about partnership. We believe we must work together with other groups, transcending organisational, geographical and cultural boundaries to accomplish the mission to which we have been called. Today, we have partnerships all over the world. We’re really good at partnering with agencies and indigenous ministries, and we are committed to partnering well with churches to help them reach the least reached. For many decades, we were known as a cutting-edge mission. If a technology didn’t exist, we invented it. If there was no cure for an illness, we’d find one. No task was too big or confusing. We figured stuff out: “Need a radio transmitter to fit in a suitcase. We can do that.” Recognising that we live and minister in a dynamic and ever-changing world, we continually seek improved ways of carrying out our mission, whether it is embracing digital media and ways to provide content in high security countries, or looking at medical and engineering advancements to be the hands of Jesus to the least reached. 1. THE TRINITY: We believe in one God, existing in a trinity of persons: Father, Son and Holy Spirit (John 15:26), who are eternal and of equal dignity and power (Matthew 3:16, 17). 2. THE BIBLE: We believe that the Bible is the Word of God, verbally inspired and without error as originally written, and that it is the only infallible rule of faith and practice for the Christian (2 Timothy 3:16; 2 Peter 1:21). 3. THE PLAN OF SALVATION: We believe in Jesus Christ, conceived of the Holy Spirit (Matthew 1:20), born of the virgin Mary (Luke 1:35), whose death on the cross for the redemption of sinners provided a sufficient and complete propitiation for their sin and guilt (1 John 4:10; Ephesians 1:7), and who rose again for our justification (Romans 4:25), ascended into heaven, and is now seated at the right hand of the Father, interceding for all those who come unto God by Him (Hebrews 7:25). All who believe in and receive the Lord Jesus Christ have eternal life; those who do not will be eternally lost (John 1:12; John 3:36; Romans 10:9,10; 1 John 5:11, 12). We wait for the “blessed hope—the glorious appearing of our great God and Saviour, Jesus Christ” (Titus 2:13), and we believe that all things shall finally be subjected to God through him (1 Corinthians 15:25-28). 4. THE CHURCH: We believe that the true church, which is the body of Christ (Ephesians 1:23), is formed by the work of the Holy Spirit in all those who trust Christ as their Saviour (Ephesians 2:22 and 1 Corinthians 12:13). 5. THE CHRISTIAN’S MINISTRY: In view of Christ’s last command (Matthew 28:19, 20) and recognising the lost condition of all those who fail to accept the gospel message (John 3:18, 36), we believe in the urgency of every Christian’s responding to the great commission of Christ. “For God so loved the world that he gave his one and only Son, that whoever believes in him shall not perish, but have eternal life” (John 3:16). It is to the work of helping to carry out the plan of God in this age that Reach Beyond is dedicated, in conformity with the last command of our Saviour to “be my witnesses . . . to the ends of the earth” (Acts 1:8). With the God-given means at our disposal, the message of the gospel, which “is the power of God for the salvation of everyone who believes” (Romans 1:16), is being literally carried to the ends of the earth. We also seek to carry out the command of our Saviour to teach all nations (Matthew 28:20), in addition to evangelising them. A drive six kilometres west of the township of Kununurra will take you to the mighty Ord River. If you cross the river and take the first road to the left you will arrive at Reach Beyond’s Broadcast Facility at Lot 579, Packsaddle Road. Reach Beyond has a 200 acre farm, currently growing bananas, mangoes and sandalwood trees and is the home of the newly opened Alta-1 College. Accommodation for long-term or short-term mission staff and volunteers is located on site. A Sunday afternoon tour (during the dry season from May to September) of the property takes visitors a further three kilometres to the broadcast facility itself, with its high antennas (the tallest is 128 metres) and transmitter building. The transmitter building, towers and antennas have been built and erected by a core group of experienced staff supported by a multitude of volunteers, all made possible through God’s provision. We’re excited that Alta-1 College, a highly respected multi-sited school with metropolitan and regional campuses across Western Australia, has partnered with Reach Beyond to establish a new campus on our Kununurra property. 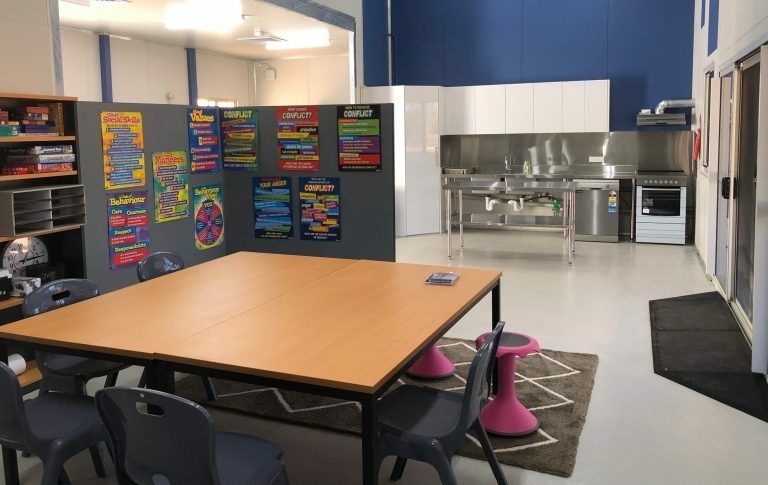 “We have been talking with Alta-1 for some time now and we’re very impressed by the model of education they have developed so that students will stay in school who would otherwise fall through the cracks. The love and care that the staff and leadership demonstrate towards their students is clearly evident. Having moved our broadcast operations ‘out the back’ onto a larger, more suitable parcel of land a while ago, allows us to convert the old transmitter building that has been sitting empty, into a modern classroom facility for the students of the Alta-1 College. Alta-1 College Kununurra will initially target its services at middle school (lower secondary) girls. Alta-1 has commenced with a small group of students, eventually building to a maximum of 25 students. For more information about Alta-1, click here. 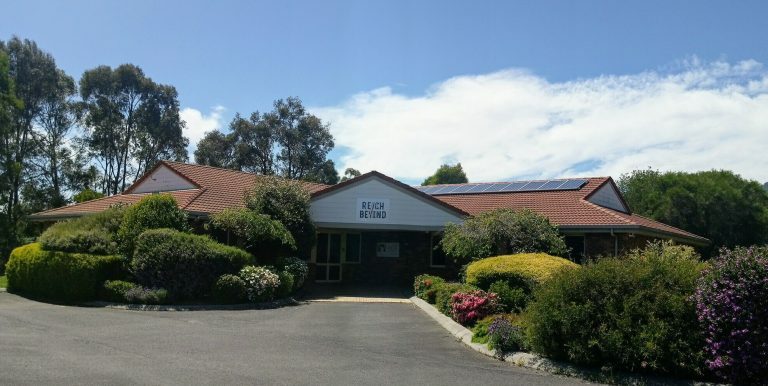 Our administrative office and studios are located in Kilsyth, in the eastern suburbs of Melbourne. Situated on one acre of leased land behind Canterbury Gardens Community Church, the studios have been operating since 1993. The studios originally provided recording facilities for a number of programs for broadcast by shortwave partners. Then when broadcasts began from Kununurra in 2003, studio operations grew to include scheduling and playback of all pre-recorded radio programs as well as live English broadcasts. Today, with a greater emphasis on Asian languages provided by partners we’ve met over the last several years, we no longer broadcast live in English. The studios continue to be busy with a growing shortwave schedule, currently broadcasting in 30 languages each week. Three radio programs are also recorded or produced at the studios: Family Care, Focus on the Family Australia and a program for Vision Christian Radio.